sinking. Back in Galesville, MD when we hauled the boat I had the main engine exhaust fitting replaced. Now I’m replacing the rest of the fittings; and none too soon. The people in Te Tau Tua had plans with their family each day this week and with the winds mild and the calm anchorage we chose now to make the change. 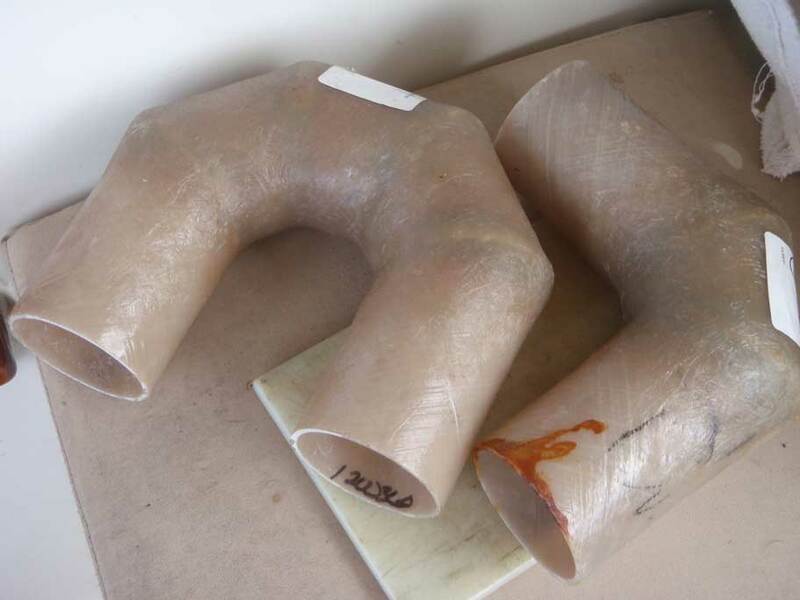 I had purchased the fiberglass fittings in Panama as well as the new hose clamps and this task was on our list to do during the off sailing season. My estimate was that it would initially take 2- 3 days. As usual I was wrong. Day one: I found we needed to do a lot of preparation. I spent time removing the hoses and fittings from the Aqualift muffler aft. I wasn’t going to remove the last first as that travels slightly level and down to the thru hull fitting and the boat with the long run in the exhaust and middle cockpit configuration has no seacock / valve on the thru hull. I’ve never yet heard of a Westsail 42 getting water in the engine from a following sea so I’ve been reluctant; some would say cheap, to add that to the system. For this job; I was planning on stuffing a tennis ball wrapped in a cloth in the thru hull and if that won’t block the water completely; I doubted it would, it will slow down the intrusion enough that we won’t sink. I removed the hose clamps, finding two that were almost hidden and broken. I’m quite glad we’re doing this. And I work my hands to the bone trying to dislodge the hose from the Black Iron fittings that Westsail used in the system. I remember an old yard manager saying that in a battle between a hose fitting, the hose, and the installer usually the hose won. The results meant replacing the hose. That was not an option here. I did not purchase any extra hose. So to make this work I needed all the hose intact. One trick another yard employee had shown me was to put a hose clamp near the fitting but not over it on the hose. Then tighten the clamp and that would shrink the hose near the clamp breaking the hose connection on the fitting. I did that and who knows how much it helped but eventually I was able to remove it. 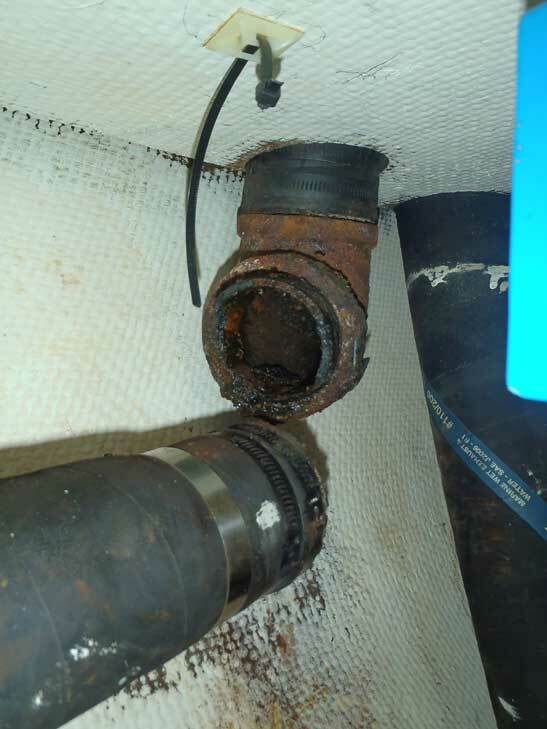 What I’m mildly surprised about is that we had two surveyors go over the boat; once when we purchased it and the other when we launched it seven years later and neither one saw any problem with the setup nor mentioned that those fittings need to be replaced after X number of years. After removing the exhaust hose from the Aqualift muffler I then removed the first elbow from the muffler and then began to work on the inverted U. Here was my first major problem. The hose is stiff and I didn’t want to add any real “kinks” to it because I didn’t buy any replacement hose. It’s a big hose; 3 1/4″ od. So all I could do was wiggle the U and try to twist and turn the fitting. I tried the hose clamp trick just off the fitting. Nothing. I tried talking to it; and not kindly I might add. Nothing. The hose and fitting just didn’t want to listen. Time for more drastic measures. The only way I could see to break the hose free of the fitting was to hack saw the U into two pieces and then I could remove each piece separately. But, since the fitting rested next to the hull this wasn’t going to be easy. I wedged the hose out as far as I could and then began. I had only about a 3″ stroke with the hack saw and I was twisted, half bent, leaning off balance and only using my right hand. Yeah, so what; I’m ambidextrous but in this position I just could not get my body in position to alternate with both hands. I sawed for 5-10 minutes and took a few minutes break. Almost an hour later I was finished. Finished and tired. I worked the fittings off the hose and then… I quit…. for the day. No use burning myself out! Much of the threads on one fitting had rusted away and I wondered about the threads on the lowest elbow closest to the thru hull. My hands and knuckles were taking a beating. I counted over 20 nicks and cuts in one hand alone. Ouch. That gave me time to rethink how I was accomplishing this task and to prepare for tomorrow. That was a tennis ball day and I expected it to be the most difficult. 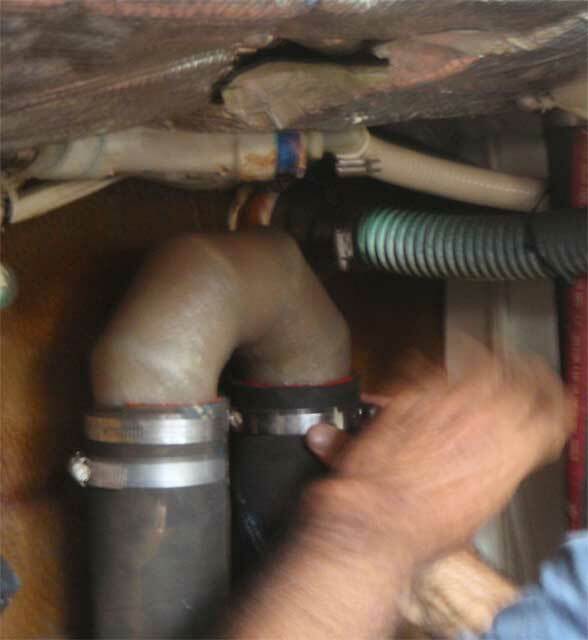 Day two: The exhaust system runs up the port side of the boat, inside a locker, up to an inverted U and there it runs back down; inside the locker and then aft to the thru hull. The second day I was to disconnect the rest of the system and then put the new 90 degree elbow in the aft section. Once that is in I’ll raise the hose as high as I can in the locker to ensure no leakage. The following day I will add the rest. With the tennis ball I would put a piece of cloth around it and stuff it into the thru hull from outside the boat. Should any water find it’s way into the boat I felt it would be slow enough that we would not sink. Besides once I had the fitting off I would put on the new one as quickly as possible and then make sure it is raised above the waterline so there would be NO water entering the boat. out. On the bottom of the hose I left some of the broken fitting so now I’m needing to reach into the locker and using a blade screwdriver; bend 180 degrees around and working out the piece stuck to the hose. After a few more vocal outburst about the impossibility of the job I was able to break the broken piece free. Now it was time to clean up the hose and attach the elbow. heating the hose with the heat gun (a very necessary tool to have aboard) and using silicone gasket sealant I was able to with some colorful language and as much might as I could muster pull, twist and turn, twist and rock and turn, get the fitting to slide on the hose to it’s final resting place. Now as I could still move it a bit I aligned the elbow to the top inverted U. As by now this was one hell of a day it was where I called it quits. I wedged the last hose fitting on the hose as high as I could and to ensure no water ingress. One phoopa I forgot to mention is that the new hose clamps I had purchased; all T clamps were too small. I hate, and hate might well be too nice a word, I HATE that with fittings there are actually two measurement systems. One is pipe and the other hose. They are not the same and continue to get me in trouble. I sized the clamps one size too small. Fortunately the clamps I had; most were fine, and I did have some apart of the worm screw ones. If those failed I have a great tool called the Clamp Tite and I could use that. So the project continues on. Day Three: In the morning I was raring to go. NOT! My hands were cut up and I was sore but W/ would have none of my excuses. We had a project to do and right now the boat could only move under sail. You might think; hell, they are a sailboat, but sailing in a lagoon can oft be problematic. There are numerous obstructions in the lagoon and anchoring too demands often times jockying around to find the spot of least coral. So off to work I go…. This was the day to finish up the plumbing. I attached the other fittings and the last item to do was the U. It seems to me that I can’t ever replace something the way I found it. I always try to improve it. Sometimes I’m successful; once in awhile I’m not. I didn’t like how level the hose ran out of the boat from the last 90 degree turn to the thru hull so I figured I would create a gentle slope raising the last elbow in the chain a bit. Also I figured that if I cut an inch or so off the upper part of the hose the fitting would slide on much easier because I wouldn’t be fighting any of the molded in threads that the pipe fitting left. So back to the hack saw again and away I went, carefully cutting an inch off the top. Needless to say my cut was not perfectly square but it would do. I was down to two steps left: put the U on and secure it to the fitting holding it in place high on the inside of the hull. I heated the hoses up, waited, heated some more, waited and heated a little more till I felt that the hoses were a wee bit softer and would expand just enough for me to slide the fitting on. I added the gasket sealant ( I hope never to have to remove this in place again) and then began to slide the U on. Magically; it went on. Now just to let the hose cool down, add the hose clamps and then add the top bracket. Cutting the inch off, using fittings that were just a little different made the bracket at the top a little out of reach. I struggled getting the lower hose up through the sidewall of the locker. W/ pushed with all her weight 🙂 and I pushed pulled and shoved at the turn. Finally we got as close to the bracket as possible. But when I tried again the top U it just barely would not work. Seems as my plans don’t always come together perfectly. Time to fabricate an extension. We had some left over Aluminum from a project in Trinidad so I used a piece of that, drilled some holes and attached it to the top most bolt. Then I could attach the bracket to that extension and viola! We have a solution. An hour later we were good to go. Now it was time to wait. Tomorrow I would check and tighten all the hose clamps and we would fire up the diesel to check for any leaks. Barring none we could then inventory (always we seem to inventory) and then repack the locker and the engine room. Day 4 (of a two day job): Today ought not be too difficult. After checking the clamps and tightening a couple we started the engine. 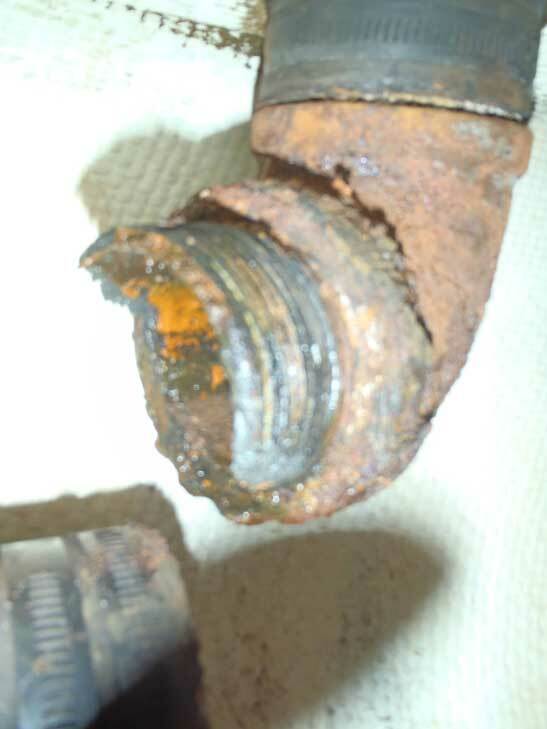 With a small torch I checked every fitting for leaks and hard to believe; I found …none. We ran the engine for a bit letting everything warm up and I checked again and still things were hunky dory. Shut down the good ol’ Perkins and begin to repack the locker. As always; when we have supplies out of one locker we are looking for ways to improve our storage of “stuff”. We decided that we could move the “flopper stoppers” and that would free up a great deal of space on the counter. As we have used up supplies and given unused supplies away we found room in other lockers. But moving anything in a boat is problematic. Most often you need to empty a locker out and then repack it. And when we empty a new locker out we check it against the inventory and then repack it. Today, while basically an easy day (I will not have to twist, bend, grunt, talk to fittings, slice up parts of my body, etc) finishing this job will take a good part of the day to complete. By good part I mean “all morning”. We’re retired. If we can avoid it we don’t work in the afternoon. Afternoons are hot. And if it is not really hot it is humid. Sometimes it is both hot and humid so for our sanity, if we can avoid working in the afternoon we do. And mostly we ‘re successful. With the locker packed up, stuff moved, inventory fixed, we are ready to cross this job off the list. Yeah! This entry was posted on Monday, January 5th, 2015 at 1:39 pm	and is filed under Places. You can follow any responses to this entry through the RSS 2.0 feed. Both comments and pings are currently closed.